A test called a vascular or duplex ultrasound may be used to examine the blood circulation in your legs. During the vascular ultrasound, a transducer (small hand-held device) is placed on the skin over the vein to be examined. The transducer emits sound waves that bounce off the vein. These sound waves are recorded, and an image of the vessel is created and displayed on a monitor. How is chronic venous insufficiency treated or managed? Avoid long periods of standing or sitting: If you must take a long trip and will be sitting for a long time, flex and extend your legs, feet, and ankles about 10 times every 30 minutes to keep the blood flowing in the leg veins. If you need to stand for long periods of time, take frequent breaks to sit down and elevate your feet. Exercise regularly. Walking is especially beneficial. The goals of treatment are to reduce the pooling of blood and prevent leg ulcers. The most conservative approach is to wear properly-fitting support hose (also called compression stockings). Compression stockings can be purchased at some pharmacies and medical supply stores and come in various styles, including below-the-knee, above-the-knee and pantyhose styles. They also come in different compressions varying from 8 to 10 mm Hg, up to 40 to 50 mm Hg. Your doctor can recommend the compression that is right for you. You will need a prescription for any stockings with more than 20 mm Hg compression. If you wear compression stockings, be sure to take them off at the end of the day to wash and dry them, and to clean and check your skin. Make sure the stockings fit so there is no bunching. Elastic stockings that fit poorly can actually make your condition worse by blocking blood flow in the area where they have bunched up. Some studies have shown that combining elastic socks with prescription medication to improve blood flow is very effective when the socks alone do not control symptoms. Antibiotics may be prescribed to clear skin infections related to CVI, but the underlying disease must be treated to prevent a recurrence. Deeper infections and ulcers may also be treated with antibiotics. If you have post-thrombotic syndrome, your doctor may prescribe medication to prevent the formation of additional blood clots. A special medicated wrap, known as an Unna Boot, combines multilayer compression with a zinc oxide gel-based wound cover that forms a semi-rigid bandage. Other multilayer compression systems are available and are often used in combination with topical wound care products. Some patients have found benefit from the herbal dietary supplement Vena-Stat, which contains a derivative of horse chestnut extract. Keep in mind that herbal preparations should not be used in place of your prescription medications and should be used with caution, as they may interact with current prescription medications. Please ask your doctor or pharmacist about any potential drug interactions. Practicing good skin hygiene is important. Keep your skin moisturized so that it doesn’t flake or crack easily. If the skin is not broken or leaking fluid but is inflamed, your doctor may recommend an anti-itch cream, such as one containing hydrocortisone; a cream containing zinc oxide to protect the skin; or an antifungal cream to prevent fungal infections. Skin that is leaking fluid is treated with wet compresses. If you have ulcers on your legs, your doctor will show you how to apply layered compression bandages to protect the skin and maintain blood flow. Nonsurgical treatments include sclerotherapy and endovenous thermal ablation. Sclerotherapy involves the injection of a solution directly into spider veins or small varicose veins that causes them to collapse and disappear. Several sclerotherapy treatments are usually required to achieve the desired results. Sclerotherapy is simple, relatively inexpensive, and can be performed in the doctor’s office. Sclerotherapy can eliminate the pain and discomfort of these veins and helps prevent complications such as venous hemorrhage and ulceration. It is also frequently performed for cosmetic reasons. Endovenous thermal ablation is a newer technique that uses a laser or high-frequency radio waves to create intense local heat in the affected vein. The technology is different with each energy source, but both forms of local heat close up the targeted vessel. 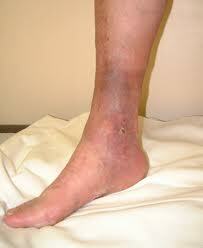 This treatment closes off the problem veins but leaves them in place so there is minimal bleeding and bruising. Compared with ligation and stripping, endovenous thermal ablation results in less pain and a faster return to normal activities, with similar cosmetic results. For the less than 10 percent of patients who require surgical treatment, the options include vein ligation and stripping, microincision/ambulatory phlebectomy, and bypass surgery. Here is a brief review of each of these techniques. Your doctor can recommend the treatment that is most appropriate for you. Ligation and stripping often are performed in combination. 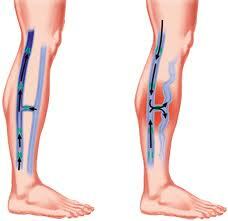 Vein ligation is a procedure in which a vascular surgeon cuts and ties off the problem veins. Most patients recover in a few days and can resume their normal activities. Stripping is the surgical removal of larger veins through two small incisions. Stripping is a more extensive procedure and may require up to 10 days for recovery. It usually causes bruising for several weeks after surgery. Microincision/ambulatory phlebectomy is a minimally invasive procedure in which small incisions or needle punctures are made over the veins, and a phlebectomy hook is used to remove the problem veins. 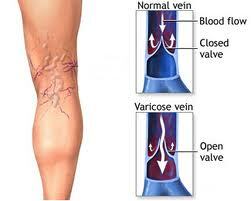 Vein bypass in the leg is similar to heart bypass surgery, just in a different location. It involves using a portion of healthy vein transplanted from elsewhere in your body to reroute blood around the vein affected by CVI. Bypass is used for treatment of CVI in the upper thigh and only in the most severe cases, when no other treatment is effective. Avoid wearing restrictive clothing such as tight girdles or belts.